The 1906 San Francisco earthquake and subsequent fires destroyed Levi Strauss & Co.'s headquarters and two factories. A Jewish peddler turned Gold Rush merchant created the garment of choice for Forty-Niners and cowboys. A century and a half later, blue jeans are an international symbol of independence, equality, freedom, and youth. 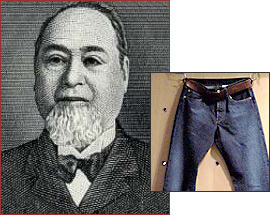 Levi Strauss, along with Nevada tailor Jacob Davis, invented blue jeans in 1873. Strauss had come to New York in ship's steerage with his mother and three sisters at age 18, in 1847. Toting as much as 100 pounds of sewing goods, blankets, and kettles, he walked New York and environs as an itinerant peddler, coming back to lower Manhattan every Friday evening for the Sabbath. Seeking to take advantage of the giant sales opportunity created by the California Gold Rush, Strauss booked passage to San Francisco, arriving in March 1853. The city's 70,000 residents were already served by 117 dry-goods stores, but many lacked merchandise. With Strauss' brothers supplying goods from their new store on New York's Houston Street, Levi and his brother-in-law, David Stern, joined the competitive fray. One of Strauss' customers, a Reno, Nevada tailor named Jacob Davis, designed heavy cotton work pants in 1870, hammering rivets onto the pocket corners to make them more durable. Unable to afford a patent application, Davis proposed a partnership with Levi Strauss & Co. in 1872. "The secret of them Pents," he wrote, "is the Rivits that I put in those Pockets and I found the demand so large that I cannot make them up fast enough." Strauss took Davis up on his offer, and the Nevada man moved to San Francisco to become head tailor and production foreman. Their "waist high overalls" quickly gained favor among the region's miners, teamsters, lumberjacks, and farmers. By the end of 1873, thousands of San Franciscans were wearing Strauss and Davis's pants. The company would later register the name "Levi's" as a trademark. Levi Strauss & Co. sent sales representatives across the nation and around the globe, touting their clothing to workers. Anyone who needed durable pants -- and that was nearly everyone -- wanted a pair. Levi Strauss retired from day-to-day work as early as 1886. When he died in 1902, he left the company to his four nephews. But in a way, the story was just beginning. The pants found immortality by coming to represent the rebellion and romance of the untamed American West. Hollywood stars wore them, kids adopted them, and they became a social phenomenon: a worldwide symbol of youth, independence, ruggedness, and freedom.